entering a page number and clicking Go. Contains minutes of general meetings, annual general meetings, emergency meetings. 25 Apr 1911 it was resolved to offer a re-engagement to Jack Taylor and a benefit of 250 next season. 26 May 1911 it was agreed that the Club would resign from the Lancashire Combination and form a new League. 8 Jun 1911a new league known as the Central League had been formed. 28 Nov 1911 it was agreed to hold the benefit for Jack Taylor on Christmas Day 1911. 20 Feb 1912 it was decided to duplicate each position in the team with first class players. 22 Apr 1912 it was agreed that the Club's share of gate receipts from two matches should go to the Titanic Disaster Fund. 26 Jul 1912 it was agreed to form an amateur team to play in the Wednesday League. 13 Aug 1912 it was agreed that a benefit for a first team player should be for a fixed amount of 500. 25 Sep 1912 Mr Clayton's motion to rescind the resolution to engage the Secretary for 3 years at a salary of 450 p.a. was defeated. Minutes signed by William Whitford, W. R. Clayton, B. Kelly. League and Combination Team Results 1910-11 pasted to inside front cover and flyleaf. Agenda for meeting pasted in opposite minutes of 4 Apr 1911. Loose agenda between pp.9-10, pp.17-18. Lists of players to be retained and transferred pasted in after minutes of 25 Apr 1911 and 25 Apr 1912. Letter giving notice of the A.G.Ms on 22 May 1911and 23 May 1912 including balance sheet pasted in before minutes of the meetings. Letter from Companies Registration Office opposite minutes of meetings on 24 Jul 1911 and 25 Jul 1912. 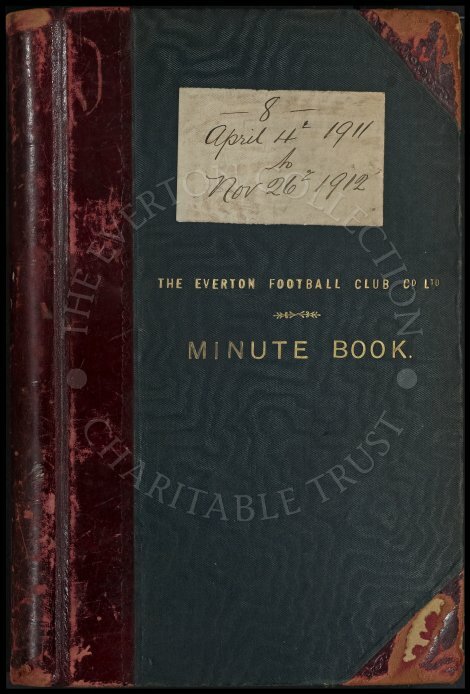 Copy of letter from Everton Football Club Co. Ltd. to pasted in next to minutes of 23 Jan 1912. League and Central League Team Results 1911-12 pasted to inside back cover. Includes index.